I have a fun, behind the scenes story that I was just telling Patricia and the kids and I thought it would be of interest to many Patriots fans, especially with the kickoff to the NFL season upon us. What triggered this story was watching the movie The Doors the other night on TV. During the movie there was a scene with the cantata Carmina Burana, composed by Carl Orff, playing in the background. 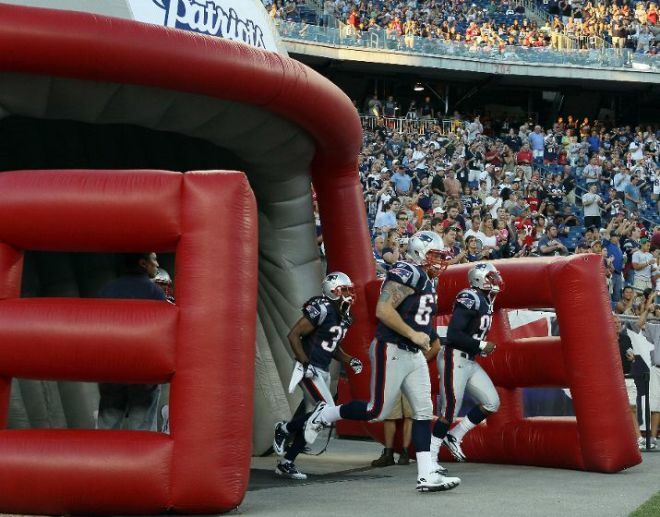 If you are a Patriots fan and have been to games at both Foxboro Stadium and Gillette Stadium, you will recognize the work as the music played prior to the players running out of the inflatable tunnel and onto the field. What you probably don’t know is how it all came to be, playing both Carmina Burana and Crazy Train by Ozzy Osbourne. When I started with the New England Patriots, one of my responsibilities being in charge of marketing and events was “game entertainment”, which included all the music and videos that were played on the video boards in the stadium. During my rookie season in 1997, I would “produce” the game entertainment from the corner of the end zone in Foxboro Stadium; talking with the control room about the music, videos and commercials being played and making decisions on when to run them to get the crowd going. Most of the creative content was stuff that had been used for years and being my first year, I didn’t change much and kept everything in place while I got a feel for things. After that first season, I felt there was an opportunity to improve things and really have some fun taking things up a notch. I had a number of duties and felt that having a full time producer was the way to go, so I hired a talented guy who worked for me at WEEI, Gary Grodecki, to take over the day-to-day responsibilities. One of the things I wanted to change was the music the team used to come into the stadium prior to kick off. It was the Jock Jams music, Are You Ready for This. It probably was fine when it was first used, but it was getting stale and most stadiums were using it, so there was nothing special about it. I wanted to make things a bit more dramatic to really get the crowd jacked up for kick off and I had a couple of ideas of what I wanted. I went to Andy Wasynczuk, the COO of the team at the time, and asked him if I could purchase an inflatable helmet for the players to run out of prior to the game and during introductions. I couldn’t tie the purchase to revenue so it was a little harder sell (especially since I was still pretty new to the organization), but to Andy’s credit he gave me the thumbs up (I assume ownership was on board too, but I never asked). The helmet was the first ingredient to help with the new intro. I liked that the players could be in there and we could choreograph their entrance, rather than them just trickling out before intros. The second ingredient was a song I had remembered hearing years earlier when watching a movie about The Doors. I had no idea what the name of it was, but I knew the music had an amazing building characteristic leading to a dramatic crescendo. I went to Tower Records, found The Doors soundtrack and there it was, Carmina Burana. Playing it gave me goosebumps. I knew that was the song to play before the players ran out of the helmet and get the crowd jacked up with anticipation. The last ingredient was the music to play while the team was running out and for introductions. I couldn’t find the right music. Gary and I were searching to find the right song. We discussed many, nothing fit. Nothing made us say, “That’s it.” Until one Saturday when Gary gave me a call, “Have you seen that car commercial with the Ozzy song?” he said to me. “Put on any game and you will see it, listen to the music.” AYE, AYE, AYE… Who would have figured a commercial for a Mitsubishi Montero would have provided us the link to the perfect introduction song, Crazy Train by Ozzy Osbourne. And there you have it. That’s how the Patriots introductions came into play. The rest is history. I have to say, for the years I was at the team, standing in the helmet prior to introductions and hearing the combination of Carmina Burana and Crazy Train gave me goose bumps every time. I know the last sentence seems to be a perfect place to end this story, but I would be remiss if I didn’t mention how the Patriots introductions became larger than life. It started at the beginning of our first Super Bowl victory when the team elected to come out as a team and not be introduced individually. Then it all culminated with us hosting the NFL Kickoff at Gillette Stadium, September 8, 2005 in front of a national audience, when the league built a Patriots helmet that opened up revealing Ozzy Osbourne in the helmet, on a stage above the players singing Crazy Train live after Carmina Burana got everyone on their feet. Wild! I hope that if you’ve ever been in the stadium for introductions that it has given you goosebumps too! There are 4 responses to "The Crazy Train That Led To Patriots Introductions". Nice article, Lou. Couldn’t agree more with your statement of “a talented guy…Gary Grodecki…” to which it’s obviously from a biased perspective. I know he appreciates this call out. Hope all is well on the home front! Kylie, He is extremely talented and I have always appreciated what he brought to the table. I hope you guys are well and loving living down south. Victoria is at school in Savannah, so we are enjoying visiting and southern hospitality. Tell G-Love not to be a stranger… My very best. Interesting story Lou, also loved the link. I remember that.